Downtown Manhattan with the World Trade Center in bright early-morning light seen from Brooklyn Bridge which connects Brooklyn an Manhattan crossing the East River. Manhattan is in New York City, New York in the east of the United States. 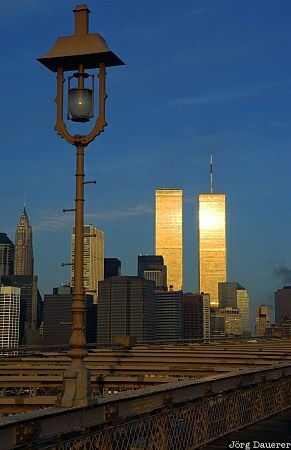 This photo was taken in the morning of a sunny day in October of 1997.